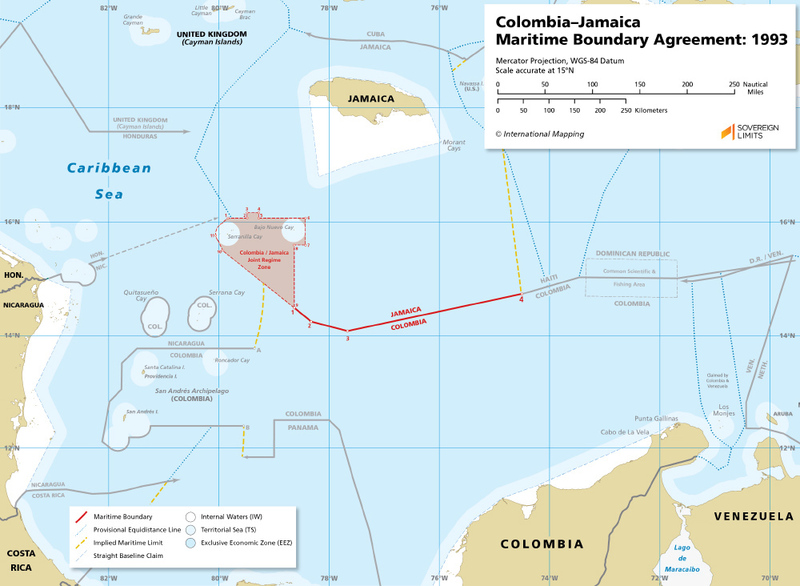 The maritime boundary between Colombia and Jamaica was established through a bilateral agreement that was reached in 1993 but did not enter into force until 1994. 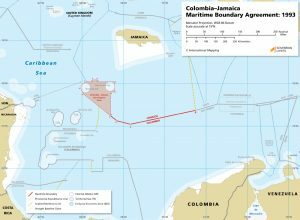 This Agreement created a maritime boundary between the opposing coasts of Colombia’s mainland and Jamaica’s archipelagic straight baseline claim. The closest Jamaican land territory to the delimitation area was Morant Cay, a bank containing four tiny islets that also served as the southeastern most tip of Jamaica’s archipelagic baseline claim. This Agreement also created a “Joint Regime Area” located northwest of point 1, which enclosed, but excluded, the territorial sea entitlements of two of the features from Colombia’s San Andrés archipelago: Serranilla Cay and Bajo Nuevo Cay.